In my years working as an actress, drama teacher and vocal coach, I have learned that to have a powerful voice, your body, breath and mind have to work together. An aligned body, free of tension is paramount in good vocal quality. We don’t need to walk around with a book on our head but we need to find our natural posture. Your body has to be free of unnecessary tension. Many of us hold tension in our bodies without even being aware of it. Holding tension can be a habit that has formed over many years, or it can be a direct result of feeling anxious when presenting. I can help you release tension in your body which will free your breath; this will bring a sense of ease to your voice and help you speak more clearly and project confidently in front of a crowd. Breath is automatic: breath comes into our body and it goes out, and we don’t pay much attention to it. As babies we breathed freely in and out, easily filling our lungs up with each breath. But as we grow older, we create habitual tensions and holds in our bodies. When we are anxious, we breathe from our upper chest in short gasps and so our lungs do not fill up to their capacity. By releasing the tension and allowing the breath to drop down and fill the lungs, you will be able to find your control and the power in your voice. The mind is a powerful thing. We think more negative thoughts than positive. You can change how you think, and have a positive outcome in your public speaking. In many ways, our brains haven’t changed much since our cave man days. Back then, we were always on guard, watching and ready to protect ourselves from the perceived threat. This habitual pattern made sense because the danger was real. Today the threat is gone but the brain still processes negative thoughts quicker than positive. Through proven techniques and exercises you will have the ability to change your attitude to make any public speaking engagement joyful, rewarding, and memorable. My goal is to free you of unnecessary tension, help you drop your breath deep into your lungs, all the while helping you foster a positive attitude that your presentation will be fabulous! Sign up to receive articles on how to overcome your speaking anxiety and present with confidence. We engaged Alyson to provide a public speaking workshop for our lawyers. From our initial contact through to the end of the engagement, Alyson was enthusiastic, professional and proved to be very knowledgeable. 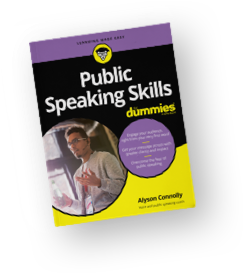 We have no hesitation in recommending Alyson to those wanting to improve their public speaking skills.